Avant STAMP (STAndards-based Measurement of Proficiency) is an online, computer-adaptive test that assesses students’ language proficiency based on the ACTFL Proficiency Guidelines at the Novice, Intermediate and Advanced levels. STAMP tests measure Reading, Writing, Listening and Speaking skills in both Interpretive and Presentational modes of communication. Currently, Avant STAMP 4S is available in – Arabic, Chinese Mandarin (Simplified and Traditional), English, French, German, Hebrew, Hindi, Italian, Japanese, Korean, Portuguese (Brazilian), Russian, and Spanish. Additionally, Avant STAMP 4Se for grades 2-6 is available in – Arabic, Chinese Mandarin (Simplified and Traditional), Cantonese, English, French, German, Hebrew, Japanese, Korean, Portuguese (Brazilian), Russian and Spanish. Since 2002, STAMP has been delivered to over 1,000,000 test takers. Educators have used the individual student and aggregated results to guide classroom instruction, implement program improvements and award credit or a Seal of Biliteracy to students who attain established levels on the test. 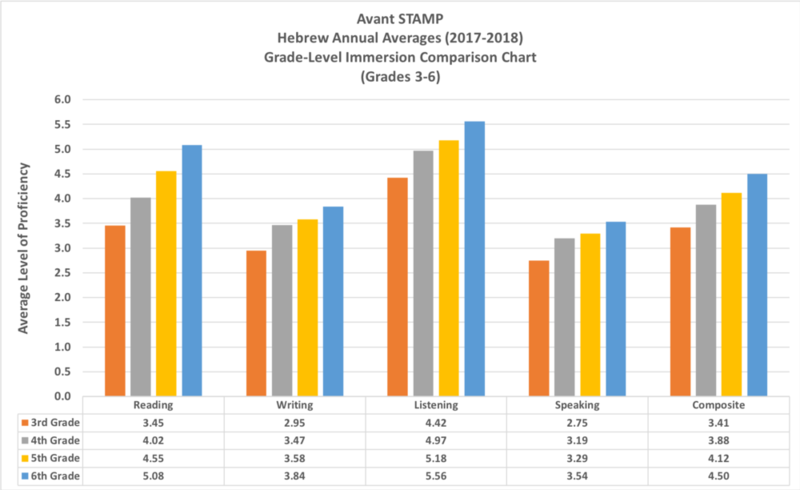 One of the frequent questions asked by educators is “how do our Avant STAMP scores compare to others?”. This report presents averages of data aggregated from test takers around the world for the 2017-2018 school year and is intended to provide a perspective of how large groups of test takers perform on the Avant STAMP tests. These group proficiency averages represent diverse testing groups and school/student populations across the country and the world. These data can be used to give some basic points of comparison as you compare these levels to the levels of students in your testing groups and will serve to help establish meaningful expectations of proficiency after an established number of years of instruction or grades levels. Critical questions to consider about these charts are found in the Points To Ponder section at the conclusion of this report. The Avant STAMP Annual Averages from the 2017-2018 academic year represent the nearly 140,000 test takers from schools across the United States and a number of international schools around the world for which we had adequate data on years of study to use in this report. The “years of study” is based upon teacher identification of each testing class/group registered in the STAMP system. For middle and high school programs, each year of study is generally equal to 120-140 instructional hours. Please use that calculation when comparing your students/courses with the levels outlined in the following data tables and charts. The data for results in Reading, Writing, Listening and Speaking are included in this report and organized by level (Elementary and Secondary) and by language in alphabetical order. We have also included in this report the “Composite” score or average of all four skills combined to provide one more view into overall ability across all domains. For this 2017-2018 report, only those languages and years of study (or grade) levels for which we had enough reliable data have been included below. The STAMP Hebrew test for elementary students is referred to as STAMP 4S Hebrew grades 2 - 6 but is listed here under STAMP 4Se for organizational purposes. The data herein does not include any testing instance related to the Seal of Biliteracy (whether a State Seal or the Global Seal of Biliteracy) nor any testing data from students in an honors class. The number of test takers per academic year differs from one STAMP language to the other, as does the clarity of the grade or year naming conventions used by different schools and districts. Avant only tags testing data that has very clearly defined grades and levels, meaning that at times a large amount of data is deemed unsuitable for these reports in order to guarantee the integrity of our yearly averages. For this reason, in the 2017-2018 report, the number of valid instances included for STAMP 4S Arabic, STAMP 4S Russian, and STAMP 4S Mandarin Chinese (both simplified and traditional) are lower than those for the other languages. Therefore, averages for these aforementioned languages must be treated with more caution. The number of valid instances included for STAMP 4Se Chinese (Traditional) is also lower than for the other STAMP 4Se languages in this report. An honors class is offered at a given grade or year of study (YOS) level. The effect of the honors class is that the students that move on to the non-honors version of a class the following grade (year) tend to be the less skilled ones, who did not make it into the honors class. An AP-level class is offered. In a similar manner as in the scenario above, students who stay in classes tagged as year 5 when there is an AP level of the course, tend to be the less skilled ones among those who were in year 4. The STAMP 4S chart for Spanish shows this phenomenon clearly, where the averages for students in year 5 are slightly lower than those averages for students in year 4. As a natural consequence, the averages for AP are much higher than those for year 4 and for year 5. Avant piloted new reading items for the Chinese Simplified test in the spring of 2018 and released an updated version of the reading test in May of 2018. The data in this report represents the averages after the change of items in the reading test. The Listening section of the STAMP 4S Italian test was revised in October 2018. Therefore, the Listening scores for STAMP 4S Italian only apply to testing instances from October 2018 and later. Following is a basic chart that shows the relationships/correlations of Avant STAMP levels to several common proficiency systems. These correlations are general and are shown here to give some general idea of how STAMP scores relate to other scales in use. More detailed correlations and research of these correlations are available through other sources as well. The following charts represent Immersion Program Data. We have not separated different immersion models in these data sets. The most prominent program model, however, is the 50/50 dual language model. The following charts represent traditional program models only. Immersion data has been excluded from these data sets. Why do the averages show changes at some levels/grades/years of study year to year? More repeat test takers are participating each year and increased readiness for the test may affect the levels slightly each year. Teachers may have adjusted their instruction to provide more “proficiency-based” activities for their students. Some languages may have larger test numbers year to year and increased numbers of test takers may influence the averages each year. A great example of this is with Hebrew at the high school level where we had significantly increased numbers of test takers this past year over previous years. Why do writing and speaking scores differ? Are teachers focusing more on writing than speaking? Are students shy about speaking in public? How is Presentational mode different than Interpersonal mode? How did the technology work for your group? What types of speaking opportunities do your students have in class on a regular basis? Do you use a proficiency-based rubric and criteria with your students? Did the students have access to the rubric/scoring criteria before testing? When is the best time to administer Avant STAMP? For 7-12 programs, administration of Avant STAMP at the end of the 1st year provides a solid benchmark. Administration of STAMP towards the end of the 3rd year provides a solid measure of the impact of the program and readiness for AP courses or the AP exam. Second year administration provides deeper understanding of programs as many students exit the program at this point, and 4th year administration may help some students be placed more appropriately in college programs. For Higher Education programs, administration of Avant STAMP (excluding for enrollment placement) in the second year demonstrates progress of languages majors and teacher prep readiness. At what level can students really start to communicate in the target language? The level at which speakers have acquired skills such that they can communicate at a “survive and cope” level in the target language is consistent with ACTFL’s Intermediate-low to Intermediate-mid (STAMP Levels 4 and 5). 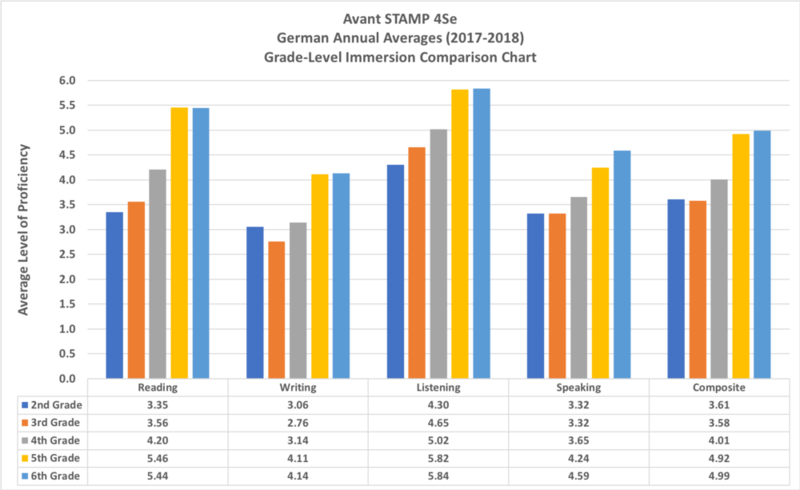 How do the Avant STAMP Results levels relate to ILR and ACTFL scales? 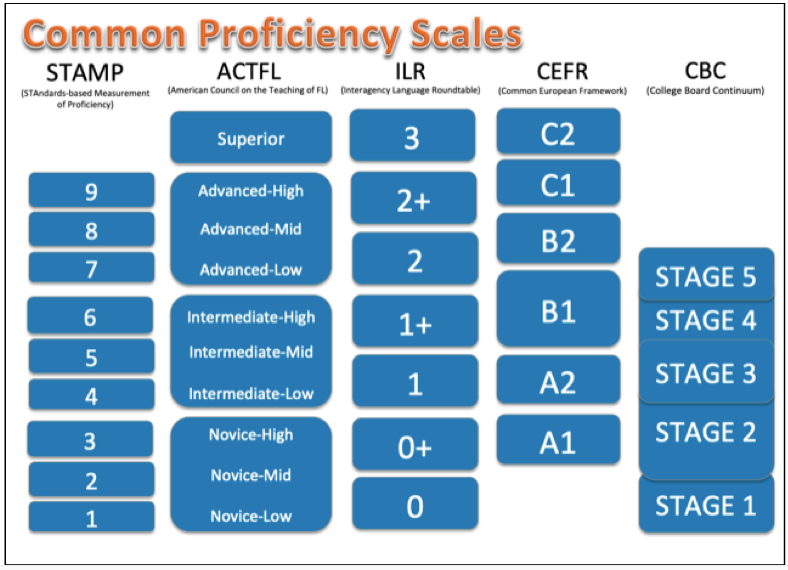 Avant STAMP Levels 1 through 8 are related to ACTFL levels of proficiency from Novice-Low through Advanced-Mid and are related to the ILR levels 0 through 2 (see chart on page 1). The transition from Level 3 to Level 4 marks the beginning of the “survive and cope” level where students have the ability to actually communicate with the ability to accomplish basic survival tasks in the language they are learning. Where should my students be? The purpose of generating the STAMP Annual Averages is to help answer this question. By looking at the averages of each year of study, this document should help identify these levels and help to establish realistic expectations of proficiency after each year of study. What is an acceptable amount of growth for each year? This is always a tricky question to address since each student will progress through the different domains in different ways and at different rates of growth. Also, it is important to note that you will observe higher rates of growth through the Novice levels and slower growth as the students enter the Intermediate and Advanced levels. However, for growth purposes, if a student achieves average growth for all domains (an average of all domains combined into a composite score) at .4 to.7 each year, which would indicate normal growth and progress patterns. If a program can consistently show this for each student, each year, that would indicate adequate average growth and represent a “healthy” well-structured program.